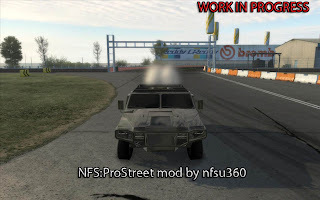 nfsu360 cracks into Pro Street. For those who have been following the modding scene of Need For Speed know that Pro street was the last NFS to date that required being altered in order to add or replace custom cars. nfsu360 has finally done it. He has just started working with the coding, and has some distance still to go before he releases the tools, however, he's already made great strides towards this. For more information you can follow his blog Here or on the forums Here. There will be a Need For Speed: Pro Street Race Day this weekend being hosted at the Chicago Airfield. The event starts on Friday night and runs until Sunday night and will be on the PC, PS3 and 360. This would be a good time to get your xbox 360 moderator achievement as well. What's it about: Test your skills at the Autobahnring and earn achievements on the way. For any Race Day requests post on the forums - let us know which tracks you want to race! Come join us and you might even get the moderator achievement on Xbox 360. I'm sure all of you have only got one game in mind right now, and I definitely cant blame you! However, if you have a quick second in between jackin' cars and slapping h***, I was hoping to get your help in spreading the word about Need for Speed ProStreet's Energizer LITHIUM Race Day Event coming up this weekend, May 2-4. So put away GTA:IV for a couple days and come participate in the 2nd Official Energizer RaceDay. XBL ProStreet Downloadable Content, Finally Available. The Extender pack was set to hit mid to late this week, and I am happy (relieved, actually) to announce that you can expect it to go live at approx. 10am PST Thursday the 21st for ALL territories (barring any catastrophic disasters). All of the extra purchase-able cars will be available through the in-game garage only, HOWEVER, I wanted to give you all the heads up that if you can wait until around 2am Friday Morning, there WILL BE TWO CAR BUNDLES AVAILABLE on XBL Marketplace! similar to what is available on the Playstation Store. The only cars that WILL NOT be apart of the bundles are the Bugatti Veyron and McLaren. #1: Dodge Challenger Concept, Lancia Delta Integrale Evo, Porsche 911 GT3 RS, Lamborghini Gallardo Superleggera, Porsche Carrera GT, Aston Martin DBR9. Note: this download requires the free Energizer Lithium Extender Pack in order to function properly. #2: Honda S2000, Porsche 911 GT3, Audi R8, Aston Martin DB9, Mercedes-Benz SL65 AMG, Koeniggsigg CCX. Note: this download requires the free Energizer Lithium Extender Pack in order to function properly. As Long as Xbox doesn't find any other reason to Delay the DLC, Xbox users will FINALLY be able to enjoy the new cars and tracks that seemed to take forever to get through the XBox marketplace wash. Rogue Speed is Hosting a Cobalt Challenge, 5 events. and only the Chevy Cobalt may be used. This raceday is open for All three main platforms, and will run until the End of Friday. The Energizer Lithium Extender Pack which contains two new tracks (Leipzig Test Track, Tokyo Expressway) and two new cars (Plymouth Road Runner, Seat Leon Cupra) is now available for free on the PlayStation network. Xbox Marketplace should receive it shortly. Ok, Before you jump to conclusions thinking this is the next NFS already announced, read up. Compete at the highest level of street racing with Need for Speed ProStreet. It's no longer good enough to simply rule your local neighborhood, you need to dominate on a global stage. In this exclusive demo, choose between the Porsche 911 GT2 and 911 GT3RS. Pit your skills and reputation against the world's best street racers on Porsche's very own Certified Test Track in Leipzig, Germany. Every dent, every scratch and every crumpled body panel is a battle scar, proof of your commitment and competitive mettle. This is your chance to prove that you have what it takes to be crowned the next Street King. Need for Speed ProStreet is the realization of the raw power, visceral aggression and intense rivalry that embodies street racing culture. For the North American Version 570.6MB Here. For the European Version 570.6MB Here. For more details on Need for Speed ProStreet LIVE Race Weekend visit http://www.xbox.com/prostreetlive. For information on how to register and for terms and conditions, visit http://www.xbox.com/nfsreg/. Registration is now open and will end at 11:59pm (ET) on January 13, 2008.
note : Track may be subject to change. Sorry PS3, and PC users, but this is XBL only. Heres a quick update on the Need for Speed ProStreet Xbox LIVE Race Weekend coming up starting tomorrow! Select your vehicle for the grip race. For this Tournament, only scores posted using the vehicles listed below will be allowed to participate. Any player who is found to be competing using any other vehicles will be automatically disqualified from this Tournament. Select the FIRST Grip race (Festival Circuit) listed in the Race Events menu. EA would like to wish you a happy holidays by inviting you to participate in a Holiday Raceday. The event will start at 1:00am PST and end on December 26th at 1:00am. The event is held at the Nevada Desert, so Bring out your Speed Cars and drive safely. You only have 5 repair markers, and we all know how hungry Nevada is for a few more wrecks to add to its junkyard. You can join this raceday by following This link.